The black fur of some North American wolves is the result of long-ago dalliances with domestic dogs, probably the companions of the earliest Native Americans. 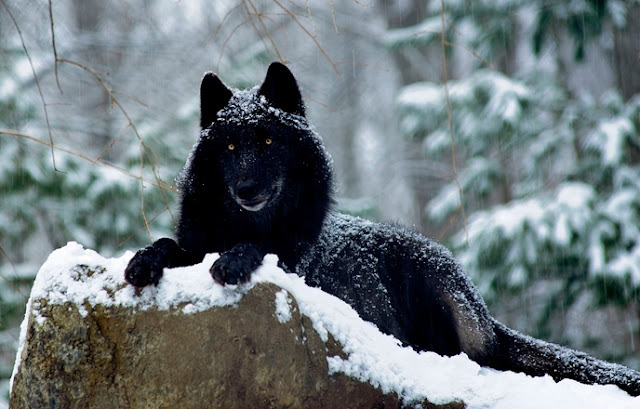 And a black coat seems to provide an advantage to forest-dwelling wolves, meaning dogs passed on some useful genetic diversity to their wild cousins. Anderson and her team compared the genes of wolves from Yellowstone National Park and the Canadian Arctic to those of domestic dogs and coyotes. They found that, in each species, the black individuals have the same mutation, which first arose about 45,000 years ago. And molecular-clock analysis showed the mutation was oldest in dogs, suggesting it originated with them and then spread to wolves and coyotes through interbreeding. This all happened in North America, because there are no black wolves in Europe or Asia (except for an Italian population that has hybridized very recently with dogs). And wolves picked up the black-coat mutation in the distant past. Responses to "Scientists Say The "Black Wolves" Are Actually Earliest Native American Dogs"
I have a black wolf dog!!! Since all domestic dogs descended from wolves, the basic genetics of the wolf probably also holds the potential gene adaptation for black fur. It has been shown that dogs and wolves can adapt shape and sizes and new features (e.g., webbing between toes)faster than most animals, due to what has been called the chameleon gene. We have black coyotes here in Ohio. We see them pretty often. I think, but I'm not sure that they are a cross between a coyote and a black wolf. It's very interesting that we have them here in Ohio. I live in Ohio and I've never seen black coyotes, are you sure you aren't just seeing stray dogs? Wolves don't live in Ohio at all and they aren't likely to anytime soon. Since both dogs and wolves share a common ancestor, as opposed to being descended from each other, I'm not so convinced wolves ever had the black mutation. Though I do see it as a possibility. My first thoughts on this were "rubbish" but I suppose 45 thousand years ago a domestic dog would probably have resembled a wolf, unlike some flat faced or other bad genetic result of human interference.